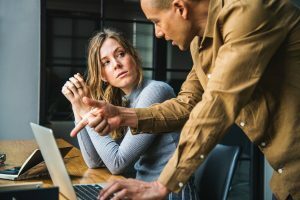 Home › Article of the Day › Negativity in the workplace – how do you handle it? Negativity in the workplace – how do you handle it? Every work environment has one or more of them: Colleagues who radiate negativity! They don’t like their work, believe they are always treated unfairly and say their boss doesn’t care for them one bit. Such negativity spreads and can eventually poison everyone in the vicinity. The best way to lessen the effect of such people on you, is to avoid them as far as possible. Set boundaries around yourself to protect you against their negativity, as it’s contagious. But what if this isn’t possible? What do you do if of necessity you have to work together? The bearers of bad news relish the negative and can for example not wait to tell you that the executive manager is unhappy and that someone’s head will roll. They flourish on such conversations while you find them extremely draining. And with good reason. Research shows that it has a bad impact on your mental, emotional and physical wellbeing. How to handle them: Handle the actual problem and ignore the rest. When such people rant and rave about something or someone, these are mostly unproductive sessions that do not deserve your time and attention. Don’t get involved. Think about quick escape methods like having to make an urgent call or still having to prepare for this afternoon’s meeting. The gossip mongers. In a corporate environment it can feel as if the rumours will never end. Someone heard that a new manager is going to be appointed, half of the division is going to be fired or no-one is getting a raise. Some people enjoy repeating rumours such as these over and over, whether true or not. How to handle them: Such people often do not take the facts into account. Press them for correct answers the next time they come to light with something unbelievable. In this way you will send the message that you aren’t interested in fatuous rumours that aren’t based on facts. Gossips will most possibly start avoiding you because the facts you insist upon spoil their game. Set your personal boundaries by making it clear that you don’t wish to become involved in office politics and remove yourself from the conversation. The drama queens (or kings) are in desperate need of attention. Often they drain their colleagues’ time and energy with the drama they use in their endeavour to hug the spotlight. Their workload is always the biggest, they always have the severest flu symptoms and their clients are the most irritating. They thrive on chaos and can always outrival your grimmest story. How to handle them: Cut the conversation short as soon as the drama begins. The more you pay attention, they more you encourage it. Ignore it and carry on with you work. The message that you aren’t interested will eventually filter through. Also don’t hesitate to give honest feedback. Make it clear that you understand your colleague’s concern regarding the problem, but mention that there possibly may be a better way in which he/she could handle it. Make sure you remain calm and rational when you address such a situation – you don’t want to inflame the drama. The pessimists greet every piece of good news with a pessimistic reaction. The sky is always falling on these people’s heads. How to handle them: Confront such a colleague and explain gently how his/her conduct is influencing the rest of the team. Such people often don’t realise how negative they are and how they are influencing everyone around them. By indicating it to them in a good way you can help them to improve and become more supportive of their team mates. The eternal victims constantly blame others for their circumstances. They are forever complaining about the bad things happening in their lives and don’t believe that they themselves have any part in or control over the situation. Such people often suspect a universal plot against them, where others are out to destroy their success. On top of this, it is the only thing they want to talk about. How to handle them: It can be difficult to tell someone that he/she is always negative. Try to explain in a pleasant way why you need more positive things in your day. You can also ask them what they could do to improve or avoid their situation. Try one of the above techniques the next time you feel as if you are being sucked into negativity. In this way you can bring back some positivity into your work environment.